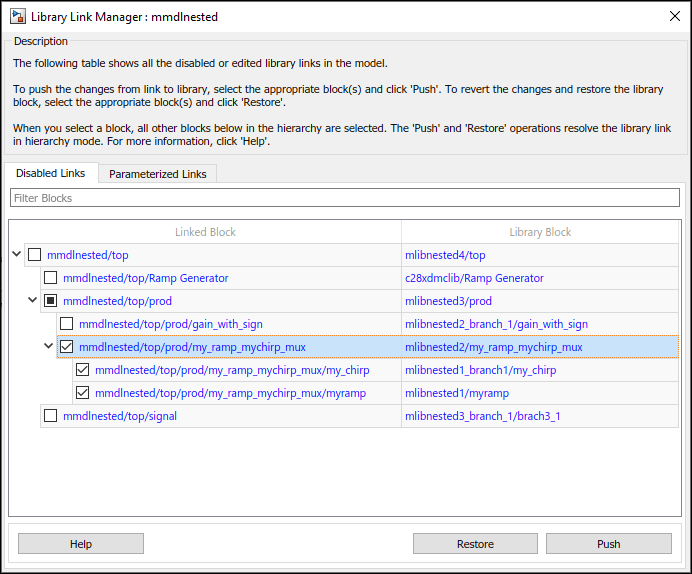 You can restore disabled library links and resolve any differences between the linked block and its parent library block. In the Model Editor window, right-click a disabled linked block, and on the context menu, select Library Link > Resolve Link. The Links Tool window opens. To view disabled links and the parameterized links, select Show all disabled links in the Options section. To restore the links for an individual block or the whole hierarchy, select Individual or Hierarchy in the Push/Restore Mode section. For more information, see Pushing or Restoring Link Hierarchies. Linked block — Displays the list of linked blocks that have disabled or parameterized links. Select a block to restore its links. Action — Allows you to either push the linked block changes to the library or restore the linked block from the library. Replaces the version of the block in the library with the version in the model (linked block). Replaces the version of the linked block in the model with the version in the library. In the Individual mode, the disabled or edited block is pushed to the library, preserving the changes inside it without acting on the hierarchy. All other links are unaffected. In the Individual mode, the disabled or edited block is restored from the library, and all other links are unaffected. To select the same action for all linked blocks, click Push all, Restore all, or Clear all. Library — Displays the library name and version number. Click OK or Apply to complete the push or restore action. The version in the library and the linked block now match. Changes that you push to the library are not saved until you actively save the library. If a linked block name has a cautionary icon , the model has other instances of this block linked from the same library block, and they have different changes. Choose one of the instances to push changes to the library block and restore links to the other blocks, or choose to restore all them with the library version. If you are using Push or Restore in the Hierarchy mode and you have a large hierarchy of edited and disabled links, ensure that you want to push or restore the whole hierarchy of links. Pushing a hierarchy of disabled links affects the disabled links inside and outside the hierarchy for a given link. If you push changes from a disabled link in the middle of a hierarchy, the inside links are pushed and the outside links are restored if unchanged. This operation does not affect outer (parent) links with changes unless you also explicitly selected them for push. The Links Tool starts to push from the lowest inside links and then moves up in the hierarchy. Link A contains link B and both have changes. Push A. The Links Tool pushes both A and B. Push B. The Links Tool pushes B and not A. Link A contains link B. A has no changes, and B has changes. Push B. The Links Tool pushes B and restores A. When parent links are unmodified, they are restored. If you have a hierarchy of parameterized links, the Links Tool can manipulate only the top level. To compare files and view structural changes, use Analysis > Compare Simulink XML Files.